William Seward was the 12th Governor of New York, a United States Senator and the United States Secretary of State. He is perhaps best known for purchasing Alaska from Russia - a move ridiculed by most until the gold and oil booms. It is unsurprising that this collector found statues of Seward in both states. 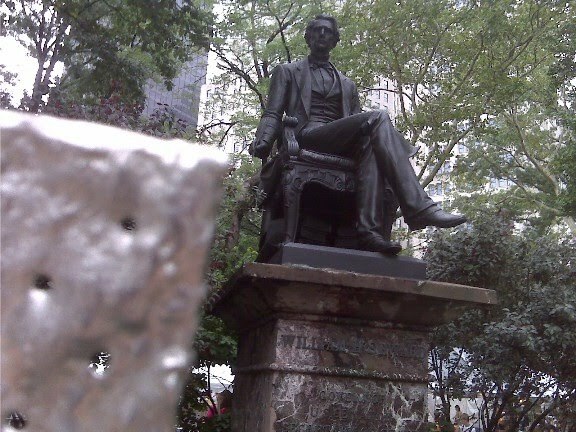 The top picture with Seward reaching out for the cracker is from Madison Square Park in New York. It honors his work as a statesman and outspoken abolitionist. She felt that the bottom Seward didn't deserve a cracker. This Seward tops a totem pole in Ketchikan, AK at the Saxman Native Village. This is a totem pole to shame Seward (red ears indicate the statue is of someone being shamed). His disgrace was based on being a guest at a potlatch and not returning the favor. (He received five boat loads of gifts including totem poles and canoes - that certainly deserves more than a thank you note).